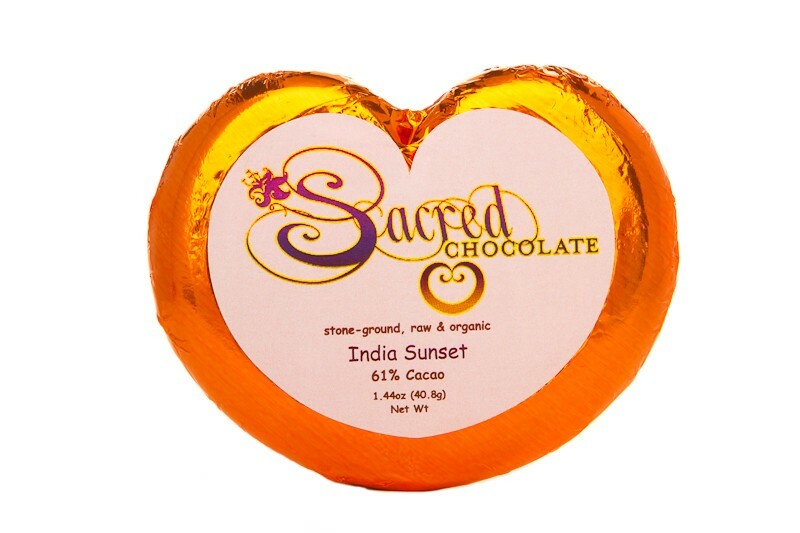 Allow your pallet to lead you on a journey through India…Sacred Chocolate's INDIA SUNSET (61% Cacao) is CARDAMOM CURRY RAPTURE! With unique Indian herbs and spices STONE GROUND right into our unique and special blend of RAW Organic Cacao Nibs and RAW Organic Whole Cacao Beans with SKINS from Central and South America, the reaction by most tasting it for the first time is just “WOW”. This chocolate is so special it was chosen to be in the 2009 Emmy Award Nominee gift bags! India Sunset was also chosen as “Most Exotic Chocolate” at the 2008 Raw Spirit Festival. As you let this amazing chocolate melt on your pallet, notes of Cardamom, Ginger, and Curry show up one by one and culminate in a carnatic symphony as the red sun sets over the teal Indian ocean. India Sunset is sweet and creamy. India Sunset is slowly stone-ground from bean to bar right in our custom chocolate factory in Marin County, California, which was designed from the ground up to make raw chocolate! Each 1.44oz bar comes in the shape of a perfect golden spiral heart, symbolic of the fact that raw cacao is so good for the heart. 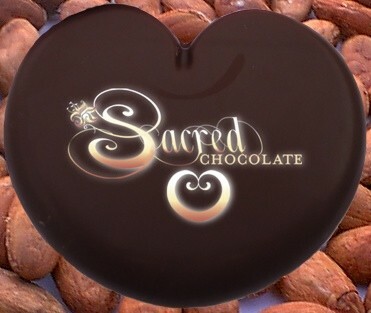 This delicious Sacred Chocolate heart bar is hand poured & hand wrapped. All Sacred Chocolate is prayed over by Sacred Steve, the Sacred Chocolate Oompa Loompas and others! "Unroasted Cacao Nibs`, "Raw Cacao Butter`, *Maple Sugar, "Coconut, "Unroasted Whole Cacao Beans with SKINS`, *Cashew, *Ginger, *Cardamom, ~Himalayan Salt, *Curry, *Saffron. `Fair Trade Certified by SPP.coop. Arriba Nacional Heirloom Cacao from Ecuador. 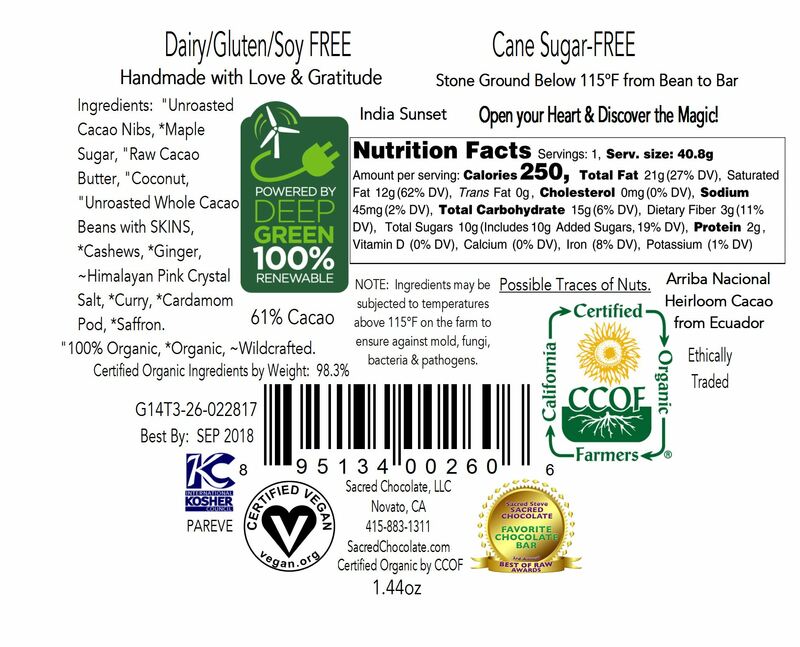 Certified Organic Ingredients by Weight: 98.3%. The medicinal use of cacao, or chocolate, both as a primary remedy and as a vehicle to deliver other medicines, originated in the New World and diffused to Europe in the mid 1500s.